Match each NFL Hall of Fame RB with the last team he played for. The team listed with his name is the team he played for most of his career. Which of these schools has not had a Heisman Trophy winner through the 2016 season? Quick! Which QB from an SEC school has the most NFL wins as a starter? That one was easy. OK, smarty pants. Which SEC QB has the second most NFL wins? Now we move to third place. The man in fourth place went to the same school as the third-place guy. We have one more guy to go before we get to an LSU grad. Who's fifth in NFL wins by SEC QBs? Who's the top Tiger QB? Let's end the place-by-place listing and ask: Who are the next two LSU QBs with the most wins in the NFL? Finally, which LSU QB has the best NFL winning % (minimum of 35 games)? Match each LSU player with the national award that he won. Classify each player below in one of these categories. Classify each of these football Hall of Famers as follows. 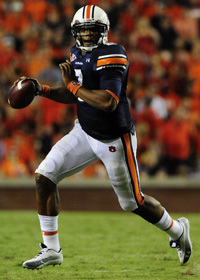 Cam Newton won the 2010 Heisman Trophy. What other Auburn QB won the award? Match each Heisman Trophy winner with the year he won the award. Who is the Division I-A leader in career rushing yards through the 2008 season? Who is the Division I-A leader in career passing yards through the 2008 season? The Heisman Trophy was first given in 1935. Who was the first winner and what college did he play for? What future Supreme Court Justice played halfback for Colorado in the 1938 Cotton Bowl against Rice? What future Academy Award winner played for USC coach Howard Jones? The player's football career was ended by a bodysurfing accident, although he didn't reveal the reason to Coach Jones because he was too terrified. He certainly played brave characters in the movies. What is the only jersey number ever retired at Ole Miss and which player wore it? Despite all its football tradition, Alabama has never had a Heisman Trophy winner. Which one of these Tide players finished highest in the Heisman voting? Two Division I-A QBs have rushed for 1,000 yards and passed for 3,000 in the same season. One was Texas' Vince Young in 2005. The other did it during the 2007 season. Who is the second QB? Who is the only future U.S. President who played in the College All Star game at Soldier Field against the NFL champions? Which one of these QBs in the 2008 NFL draft started the most college games? Who was the last Heisman trophy winner not from a current BCS conference school?